In the commercial industry it’s essential that the equipment you invest in has a high performance level which ensures that key tasks are completed safely and in a reduced time frame. To help those who specialise in the landscaping/agricultural/maintenance sector we have shortlisted our top commercial picks for this week – outlining their core design features with a short video to give you an insight into how the machinery could improve productivity and all-round performance. The Grillo FX20 is designed to mow long grass which has overgrown with lots of weeds, and as such it has a number of helpful features which are designed to improve manoeuvrability. The electric cutting height ensures a close cut whilst the electric deck lifts to 70 degrees to ensure control and performance over slopes and uneven ground. With the flick of a lever you can also discharge mulch via the rear of the mower. 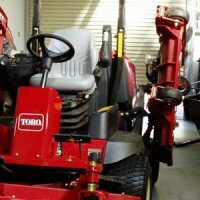 A power ride on lawnmower which has been specifically designed to withstand use within the commercial sector, the Toro Commercial 2000 Z Master is a firm favourite with many in the industry. It is easy to use and it has great functionality which ensures a neat and smart finish – perfect for commercial contractors who want to see results quickly and efficiently. This ride on mower has a great level of traction, control and power behind it which makes it perfect for off-road and external areas. The mower is designed to cover large areas of ground relatively quickly, removing long grass and maintaining overgrown areas. If you are interested in learning more about these commercial garden equipment available throughout Leicester and Northampton please click here to contact us or telephone us on 01788510453.